Residents of Maywood team up with area protestors to defend their city and drive Save Our State out. MAYWOOD, CA, 26 August 2006--Maywood handily fought off an invasion today, as the minuteman-style group Save Our State tried to force its message of rejection and hate on the small suburb on the southeast edge of Los Angeles. Five hundred people lined the barricades along the city's main street to face off against fifty SOS members behind barricades a hundred feet away. 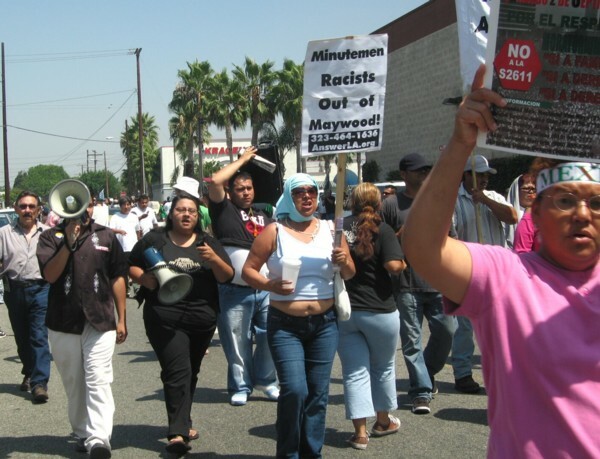 The 28,000 residents of Maywood – a small town of just over one mile square that proudly proclaims itself 96% Hispanic – are experienced at defending themselves from oppression. The "Maywood revolution" began last fall, when residents rose up against their police chief, who routinely had used roadblocks to confiscate the vehicles of undocumented immigrants and sell the cars for public revenue. Maywoodians threw out their city council and mayor in the November elections, an election in which nearly 100% of eligible voters cast ballots, and replaced them with representatives who promptly disbanded the police traffic division, demanded an audit of LAUSD, denounced the Sensenbrenner anti-immigrant resolution, endorsed drivers licenses for all residents, and proclaimed Maywood a sanctuary city, where the police would no longer check immigration or citizenship status. SOS members, who had declared Maywood a "lawless" city and called it "the belly of the beast," armed themselves with signs declaring immigrants "sinners" and flaunting the racist senator Tancredo for President. Like minutemen on the border who scoff at law enforcement procedures in their pursuit of immigrants, SOS proved themselves no respecters of the Maywood's electoral and legislative processes. Maywood city council and residents began organizing three weeks ago, on the heels of the announcement of the SOS plan to invade their town, and they welcomed allies from Latino, Indigenous, socialist, anarchist, and anti-racists groups from across greater L.A. By 11:00 a.m. both sides were lined up, and the chanting and shouting had begun. Maywood residents got down to business – the business of ejecting SOS – with gritty determination. At a church nearby, the Mayor and council members signed up people to vote and file for citizenship. The nearly all-white Save Our State group has spent the past year and a half marching into predominantly Meso-American neighborhoods and workplaces to mock Mexican, Central American, and Indigenous cultures, denounce local governments, and prevent Mexican-descent workers from working. 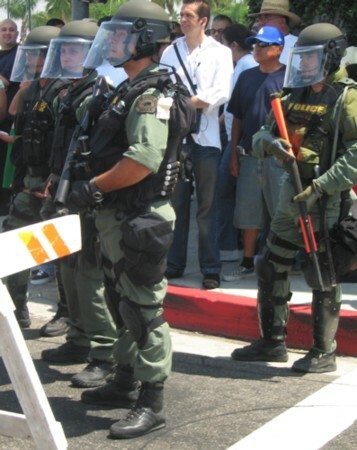 The SOS invasion of Brown people’s territory – always with police escorts – caught media attention when they invaded the predominantly Chicano city of Baldwin Park to attack a Native American and Chicano-centered public artwork there with the stated intention of “punishing” the city financially. Even before Saturday's protest officially began, an SOS woman strode through the heart of the Maywood group, coming up from behind them, and a cadre of twenty cops helped her through the shouting crowd. She was grabbed from behind but released by the crowd around her. For the next three hours, SOS repeatedly sent provocateurs, each time with police escorts, to invade and rile up the pro-migrant crowd. In another foray, the cops pushed a woman counter protestor to the ground, injuring her in order to allow a minutewoman to pass. Only one pair of about twenty different intruders were turned away by the police when the pro-migrant protestors intercepted them first at the back of the crowd, on the corner of Slauson and Pine Avenue. The crowd roared, "La migra, policía – la misma porquería." SOS members routinely encourage each other to arm themselves for protests, and routinely show up with mace, pepper spray, knives, and guns. From the organization’s beginnings, its leadership has encouraged weapons and violence, going so far as to urge members to bring baseball bats to a demonstration. SOS members, including their self styled “leader” and San Bernardino school board candidate Joe Turner, have been arrested for assault more than once. 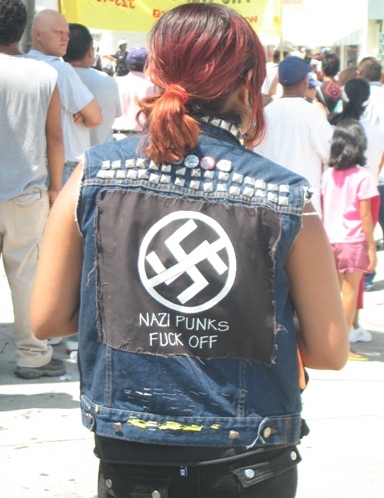 In Laguna Beach they appeared with Nazi flags. One SOS scofflaw followed a car full of counter protestors in a high speed gun-waving chase. They’ve openly applauded unprovoked police violence against counter protestors. 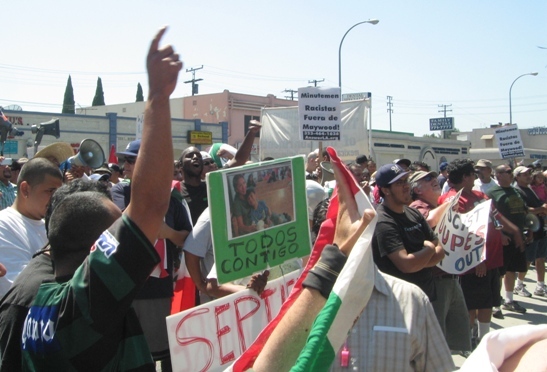 SOS instigated the apartheid-style "Anti-Illegal Immigration Ordinance" that has claimed a foothold in a few small towns in Pennsylvania and New Jersey, and in Escondido, California. The ordinance declares that the presence of undocumented people "leads to higher crime rates, contributes to overcrowded classrooms and failing schools, . . . and destroys our neighborhoods and diminishes our overall quality of life," and proclaims such people "public nuisances." 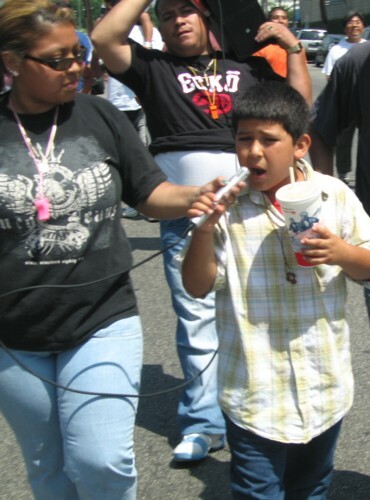 The latest target in their catalog of violence has been school children at the Chicano-Indigenous Academia Semillas del Pueblo, whom at least one SOS member threatened to bomb as SOS prepared to demonstrate against the school. When the parents in the El Sereno neighborhood organized to defend the school, SOS decided to stay home and cancelled their protest. It took only about 45 minutes of shouting, accompanied by snare drums and a mariachi band, before the pro-migrant protestors determined to confront Save Our State. About twenty-five Chicanos, Blacks, and whites had gone around the block and returned to urge the protestors to meet up with SOS around the corner. Women pushing strollers, grandparents, bikers, college students, workers, and kids giving up their Saturday joined with ANSWER-LA and marched south on Pine Avenue, intending to come up behind the SOS location on Slauson and Flora Avenue. They chanted "La lucha de obrera no tiene fronteras." Neighbors and children with Mexican flags cheered them on. But police from Maywood, Bell Gardens, and a contingent from Huntington Park in full riot gear, decked out like a squadron of Marines, moved the barricades and turned back the marchers at Flora and East 50th Avenue. Included in the police presence along Slauson was a lone Victorville officer in uniform who was also identified as a minuteman. When one protestor asked an officer why the police had determined to face their residents and keep their backs to the intruders, the officer accused the protestor of turning a "nice" conversation "hostile" and evaded the question when it was repeated. On the way back, the protestors noisily reminded the recently-reprimanded Maywood police, "Whose streets? Our streets!" Tempers rose with the temperature. The nearly all-white SOS rowdies continued their taunts and catcalls, and the Maywood defenders responded with "¡Fuera racistas!" SOS waved half a dozen large U.S. flags as they shouted that Maywood was "lawless" and "un-American," and insinuated that SOS were the true U.S. patriots. 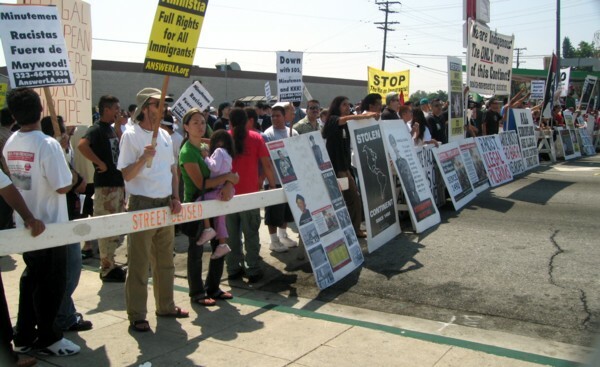 One SOSer waved a placard declaring the people of Maywood "traitors." It took only a moment, a quick dash to the flagpole at the post office, and then a cheer went up from the crowd. 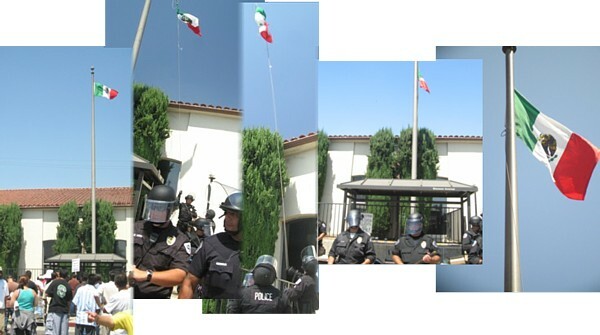 A Mexican flag was flying from the previously empty flag pole. The crowd turned north to face it, some people cheering, some shocked. When a socialist group objected to the flag, a fight nearly broke out, but the parties were separated to shouts of "¡Unidad!" If SOS were "patriots," Maywood protestors were having none of it. Twenty police swarmed the flag pole, splaying the "perpetrator" who'd raised the flag against the wall and beating him on the back of the legs with a baton. Then they set to work to bring down the flag. The crowd quieted with disappointment. But the ropes twisted, the flag wrapped itself in the cords. A Corporal Serrota tried to spin it loose, but the ropes only knotted up further, above and below the flag. The flag had freed itself and was holding on by a single clip, fluttering in the wind. Someone in the crowd shouted, "How many Maywood cops does it take to lower a flag?" and the laughter began. There the flag waved, about a quarter of the way down the pole, as the cops fumed and called in superiors. A custodial worker from the post office reached through a barely opened-door to hand the cops some keys, but they were no help. The cops gave up and took positions protecting the waving Mexican flag. Finally, the cops gave up and retreated, walking backward in lockstep, batons raised in self-defense, squeezing out and away from the hostile crowd to the other side of the barricade. One protestor looked up toward the still-waving flag and called it "magic." Meanwhile, SOS had raised a U.S. flag on an empty city flag pole at their end of Slauson without police interference. The person who raised the Mexican flag commented that "both the flag and I got beaten, but we're both still flying. I just dived at the flag pole, took my flag off its stick, and pulled it up the pole. The police grabbed me, splayed me out . . . " Here he demonstrated the requisite pose and yanked up the back of his shorts. " . . . and [Officer] Inouye hit me with his baton." The red welt was obvious to the small group around him. "But I didn't get arrested. The flag and I are free." He still held the flag's stick in his hands. At 2:00 p.m., the police escorted SOS to their cars, although protestors had gotten no closer than forty feet to them. Meanwhile, Maywood citizens and their supporters were left to walk through areas the minutemen had invaded to make their way to their cars. The protestors shouted out, "Que viva la raza! We're not criminals, we're not terrorists! We're going to fight for our rights, we're going to fight against racism" and, to the retreating minutemen, "Fuera chicken!" They raised a chorus of "Ay, ay, ay, ay, canta y no llores . . . " as the last SOSers headed west with their police protection. But Maywood upped the stakes for SOS, and the raising of the flag a new level of resistance against SOS's brand of in-your-face, violent racism. SOS, which had promised its members security for their vehicles, found their tires slashed, cars spray painted, and one car's rear window broken out. This time, in the tiny sanctuary enclave of Maywood, SOS's violence was met with violence. One protestor concluded the confrontation: "I don't think they'll be coming back to Maywood." Listed below are the 10 latest comments of 121 posted about this article.